The amount of 200 USD has been withdrawn from your account. Accounts: U4227222->U16620281. Memo: Shopping Cart Payment. 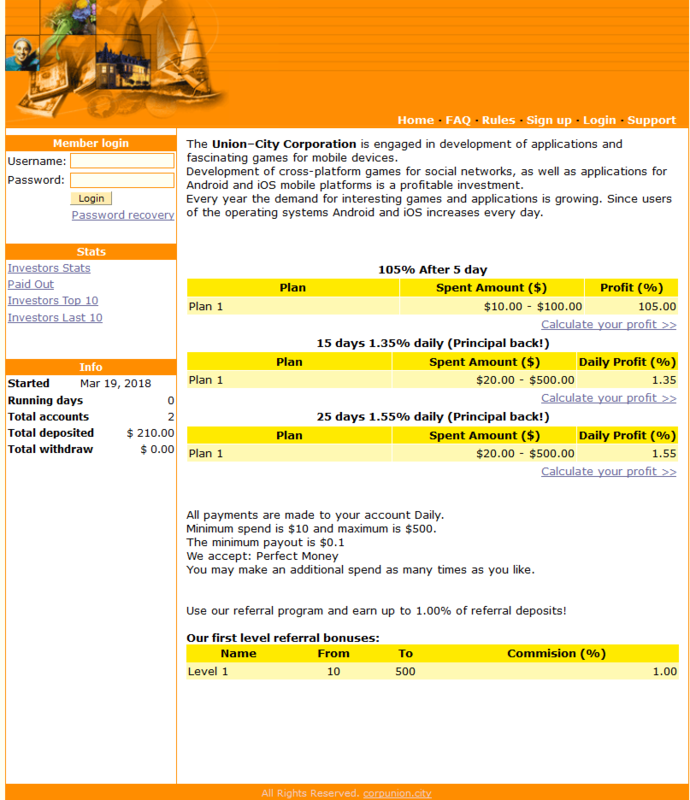 Deposit to corpunion.city User MYHYIPSNET.. Date: 14:24 19.03.18. Batch: 208828307. Для чего три плана? Чтобы больше депов привлечь? Тогда не партизан, а баблосбор. Ну, или, не клепанет. Тут как вывезет уже. СorpUnionCity	-15.07	0.075	0.66	Sent Payment 15.00 USD to account U16620281. Memo: Shopping Cart Payment. Deposit to corpunion.city User altay1734. Это голый дизайн, тот что идет с скриптом GC, пока так, типо партизанит.. Memo: Shopping Cart Payment. Deposit to corpunion.city User Metamorfozzz.. Date: 23:06 22.03.18. Batch: 209188129. Memo : Shopping Cart Payment. Deposit to corpunion.city User snadzieja. The amount of 10 USD has been withdrawn from your account. Accounts: U15914931->U16620281. Memo: Shopping Cart Payment. Deposit to corpunion.city User epifit.. Date: 04:16 23.03.18. Batch: 209199611.
где их там больше 10? Ну-ка тыкни пальцем, о гуру, никчемных постов Майхайпс, в общем-то, только и есть. The amount of 100 USD has been withdrawn from your account. Accounts: U1957***->U16620281. Memo: Shopping Cart Payment. Deposit to corpunion.city User Life2.. Date: 12:36 23.03.18. Batch: 209237814.
где их там больше 10? Ну-ка тыкни пальцем.